Every so often I like to go through the On-Demand channels in search of movies that I may want to add to my DVD collection. This is what I decided to do for this weekend's marathon. Here is a list of possibilities of movies that look interesting to me. So any in the above list that you would recommend? 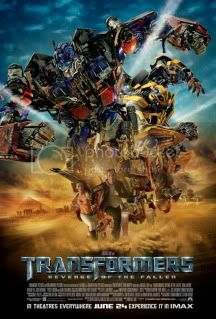 The two above I am really looking forward to seeing is Transformers: Revenge of the Fallen and Terminator Salvation. I don't think I've seen any of these though I own DVDs of two of them...Nim's Island (because Jodie Foster is in it) and Up which I got because it won the Oscar for Best Animated Feature and also because I've heard nothing but good things about it. The Hangover has a reputation as an absolutely hilarious film. I considered getting G-Force, about guinea pig secret agents (since I once owned a guinea pig not too long ago) but decided I wasn't its target audience. That's obviously aimed at the kiddie crowd. I liked Angels & Demons and think it is worth a watch. Baby Mama is ok..same with G-Force. The Hangover is hilarious - that one you won't want to watch with Brittany. I did like The Taking of Pelham 1 2 3 too. I just saw Observe and Report last week..still not sure what I think of it. Thanks.... If I am not mistaken Britt decided to go to her grandmother's house again for this weekend. Which is cool to me... that means she will be home with me the weekend of my Birthday! Well... part of me loved it. And part of me was a little on the disappointed side, I loved all the action and battle scenes. And there was definitely plenty of them! But... for me at least... it went a little downhill compared to the first one. Besides the action.... the first one had me literally laughing out loud on some of the scenes. But this one... even though they seemed to try to put a few laughs in it... it just didn't work for me. I didn't have a single laugh in this movie! Megan Fox was definitely still drool worthy.. and I did like the storyline of Sam trying to get on with his life and go to college. The length of the movie was a bit much as well. But over-all I still enjoyed it and do plan on adding it to my collection eventually. But I will wait for a decent price. Will probably wait till I can get it for $10 or under. I think if you really enjoyed the first one... you will want to check this one out as well. I meant to post a review of Transformers 3 a while back, but I couldn't stop ranting. Ok at best, dreadful at worst. First film I've seen that should have come with a dose of Nurofen to take the damn headache off! It lost me with the pathetic Terminator rip-off that made no sense at all. Almost got me back with the superb desert battle. Carl Fredricksen, a retired balloon salesman, is part rascal, part dreamer who is ready for his last chance at high-flying excitement. Tying thousands of balloons to his house, Carl sets off to the lost world of his childhood dreams. Unbeknownst to Carl, Russell, an overeager 8-year-odl Wilderness Explorer who has never ventured beyond his backyard, is in the wrong place at the wrong time - Carl's front porch! The world's most unlikely duo reach new heights and meet fantastic friends like Dug, a dog with a special collar that allows him to speak, and Kevin, the rare 13-foot tall flightless bird. Stuck together in the wilds of the jungle, Carl realizes that sometimes life's biggest adventures aren't the ones you set out looking for. Now this was a lot of fun to watch. It was amazing looking, it had parts that was sad, it had parts that were so funny you couldn't help but to laugh out loud, and it was very cute. I don't know if I want to give it a perfect rating compared to the other movies I gave a full 5 star rating to... but it is pretty close. Brittany seemed to really like it as well. At one put she was laughing so hard I had to tell her to breathe! It is a movie that is fun for the entire family. I would definitely say it is a must see! I know I will be adding it to my collection as soon as I am able to. I'm glad you liked Up. It is a wonderful movie. Though I disagree about the rating...definitely 5 stars. Utterly wonderful. A lot of reviews complained that it was a lesser film after the first 15 minutes, but how could you possibly warrant 90 minutes of that? What follows is a wonderful flight of fantasy, that anyone who has dealt with grief will recognise as that weird time as you try and come to terms. It was a perfect metaphor. I'm still going back and forth in my mind between 4½ and 5 stars. For me Up was irrevocably a five star film 20 min in... (Carl's life story). In this all new 3-D remake of the popular 1968 horror classic, Barb and her brother Johnny arrive late for the burial of their aunt and walk straight into a nightmare! 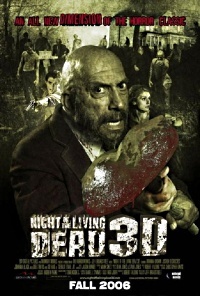 While not terrible... this has to be my least favorite version of Night of the Living Dead. I found I really didn't care for any of the characters. And I just couldn't get into the storyline they put to this version. I also think they could have went heavier on the blood and gore. It was pretty minimal considering it is a zombie movie. Really... the more I sit here thinking about it as I type this... the less I enjoyed it. As I am having a hard time trying to think of what I did enjoy about it. This is one that I don't think I would bother getting on DVD. When a news crew decides to trail a brave fire-fighting team, they never suspect that the first call for help they respond to that night may be their last. Now they're trapped in an apartment complex sealed off by the government. With no way of escape, they find themselves surrounded by frightened residents who are infected with a deadly mutant virus. What happens next is only known because of the footage they left behind. This is a movie made similar to those such as The Blair Witch Project and St. Francisville Massacre. So if you do not like that style of movie then this one is definitely not for you. I personally enjoy that style of movie. It is definitely not the best one of this type that I have seen... but I did enjoy it. First of all I did like that they had Jennifer Carpenter (Dexter's sister on Dexter) in this movie. Since first seeing her on Dexter I have become a fan of her's. I liked the base storyline. I liked how they had fun with Jennifer Carpenter's character's interaction with the firemen before things got serious. I can see adding this one to my collection before too long. I heard that [REC] was right good... I definitely want to get it and check it out. I didn't realize this was a remake of it when I watched it though.